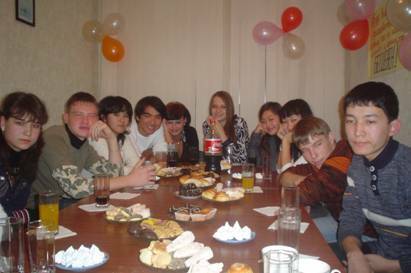 In 2001, NGO "Sana Sezim" created its Volunteer Club for older students of schools, university students, and educators of Shymkent. The Volunteer Club has initiated many activities and made invaluable contributions to the development of civil society and organizations. Today, the NGO "Sana Sezim" Volunteer Club has 30 volunteers between 16 and 30 years old. Recently, there have been significant changes in the sphere of volunteerism and it has been observed that philanthropic and voluntary actions to benefit civil society are increasing. Volunteers of NGO "Sana Sezim" have conducted numerous actions, information campaigns, and have attracted public and media attention to the problems of violence against women and children. March 21, 2007, Volunteer Club organized an informational action on eliminating discrimination by distributing booklets and information pamphlets in Shymkent. June 1, 2007, the Volunteer Club organized a chalk-drawing contest in the Central Park, Shymkent. The contest involved students from primary schools who were awarded prices and certificates. 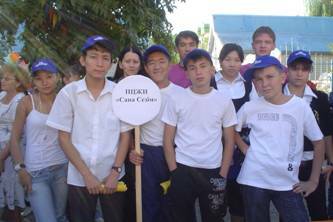 November 20, 2007, Volunteers spread information pamphlets regarding the Convention on the Rights of the Child and held discussions with children from schools in Shymkent. Volunteers Club conducted the trainings, "Know How to Protect Your Rights!" for children at schools and explained the various ways to protect individual rights, how to file complaints when rights are violated, etc. Volunteer Club organized an action to assist youth at orphanages of the Children's Home and fundraised for young families, who needed building materials, heaters, furniture, and other everyday items. "Giving Children Presents of Joy"
November 2007, the Volunteers held a clothing drive in Shymkent and collected clothes, toys, and books for children to donate to the Center of Social Rehabilitation of Children and Teenagers. Clothing items were also donated by the Returned Peace Corps Volunteers (RPCVs) of Rhode Island, U.S.A. Following the action, the Volunteers and NGO "Sana Sezim" staff were interviewed by media at the Center of Social Rehabilitation of Children and Teenagers. Every December 1st is World AIDS Day and the Volunteer Club holds its action for its World AIDS Day. This year's theme was, "Prevention of Stigma and Discriminations of HIV Positive Children." 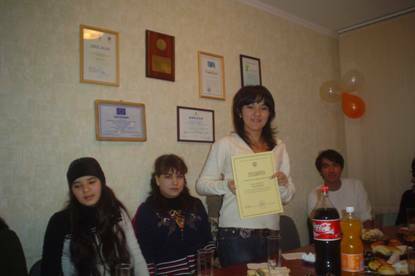 Community members of Shymkent learned from volunteers about HIV/AIDS transmission on this day. Besides informing the Shymkent community, our Volunteers distributed flyers and red ribbons to doctors, medical staff, and patients at medical institutions such as hospitals, polyclinics, and laboratories. Peace Corps Kazakhstan joined efforts with the NGO "Sana Sezim" Volunteer Club to inform the community that HIV/AIDS is a real and existing problem in the South Kazakhstan at and that awareness needs participation of all people around the world. Each December 5, NGO "Sana Sezim" celebrates International Volunteer Day to congratulate all volunteers for their hard work and reward them with certificates, prizes, letters of recognition from the NGO "Sana Sezim" and partnering schools. The above mentioned were plans and activities of the NGO "Sana Sezim" Volunteer Club for 2007. The Volunteer Club is currently making plans for 2008. The Volunteer Club also released its newspaper, "On the Way to Equality" that covers topics such as human trafficking, violence against women and children, children's rights child, ethics, and harmful effects of smoking and drugs. Its goal is to provide helpful information and increase the legal awareness of its readers. The volunteers and staff of NGO "Sana Sezim" actively support the efforts and developments of the volunteer movement in the South Kazakhstan Region.